It's really remarkable how much that happens. Do you know, when Formosa voted to join China, rejoining the Dutch wasn't even a ballot option? And we were there before the Chinese! Alaska, talk to the U.S. though I think you won't get as good a bargain price. Newfoundland, talk to the Nords! As for the other options, heck who wouldn't want Hood! Those spare turrets wouldn't be bad either. It would mean Canada could build two more modified Excaliber class BB's, something akin to HMS Vanguard. Hmm, I apparently haven't made the delusions of some back bench..oh wait they won the last election.. of some members of Government plain? Edit : Should I point out the deep historical, linguistic and cultural ties between the Muslim Mughal conquerers of Turco-Mongol background, and the (from wiki) two thousand ethnic groups their subjects comprise? Those spare turrets wouldn't be bad either. It would mean Canada could build two more modified Excaliber class BB's, something akin to HMS Vanguard. Haha, I thought you would've hit the more obvious use. Excaliber BB? Not ringing a bell offhand, tho. Time to SINK that idea of yours. Another bad would be that Japan could be laying down ships for India >20,000 tons with guns >10 inch. Nothig given in the treaty about that (after all it says "India agrees not to lay-down" and not "India agrees not to acquire"). That might have been forgotten, probably due to having the definition of 'coastal submarine' from the Cleito Treaty in ones mind. The Excelsiors are using the newer Mark II 15"/45 guns in triple turrets, as in use for the St. Vincent, Victorious and possibly the Invincible class battlecruisers (Not sure if the WW G3s got the in-production Mark Is, or the Mark IIs were built for them a decade earlier...). The 8 15"/42 Mark I guns in twin turrets would not be compatible with the Excelsior design without substantial redesign and rebalancing, which would result in a far different looking ship, especially with Canada now sporting more Type 4 docks to regularly accomodate larger construction and maintaince. The Excelsiors have many faults and compromises as a result of political pressure to keep them within the Cleito 40k ton range (with margin of error..), and the practical issue of only having two type 4 docks when they were laid down. If Canada ever undertakes further capital ship construction, expect to see an entirely new design. If Canada got a hold of the spare turrets, R&R would probably be lengthened and modernized to accomodate an extra turret (Assuming I wasn't banned from the sim for going over that "Crazy but funny" line ) and probably a pair of CDS/Monitors with one turret each. But as cool as the former option sounds, I think that'd strain credulity way too much, which is why I haven't poked at Hood (or RLBH before him) for the turrets. It'd be sweet to have the two of them operate with Hood, tho. If Cleito definitions were mentioned as the standard in the treaty, it'd apply. They don't, and no alternative definitions are offered, so it's up to each nation to interpret as they see fit (such as the modern Russian Carriers being designated as aircraft carrying cruisers to bypass the Montreux convention). Shouldn't Malaya be described as an 'enclave' rather than a 'sphere'. Certainly the 'influence' bit has waned. Hmmm, its seems whatever GB signs sure kicks off a whole heap of disscussions. Here is the OOC rationale. Britain needs oil, for her Army, Navy and Air Force and home industries. In the 1930s no-one knows the North Sea is full of the stuff! Iraq is the main provider and Persia is second to that. This Treaty is signed to make sure the oil pumps keep working and makes sure that Iraq is not interfered with either. Pakistan is of no concern to Britain any longer. It serves no strategic purpose when you consider Oman, Aden and Egypt and Iraq form the main Middle Eastern Empire with the Suez Canal smack in the middle to be protected. All the forces in Pakistan are going to Iraq or Oman. Not only have I saved extra commitments but I've strengthened the more important parts of the Empire. I would assume the Pakistanis hated British rule just as much as they'll hate Persian and Indian rule. Let them deal with the rebellous tribes up north... another hot potato offloaded to someone else. Regarding Article IV, Russia knows we mean nothing by it. What is on paper and what happens in practical politics are two different things. The Foreign Office still sees Armenia and Azerbaijan firmly as part of the Russian sphere whatever Sir Samuel Hoare publically says. The Naval Disarmament article is designed to stop India building bigger ships. Those two 10in cruisers will take long enough to build that the RN will have a response to them by then and in bigger numbers. The RN will have a supporting force of BBs in the Med and more CAs will be based in the Far East. There will be no lessening of British Naval strength and there is no mention of carriers either... basically the vauge text can be abused by both sides but Britain has lost very little in this agreement. I'm sure Gb can outbuild India in CLs too, so no real risks there either. On the other hand Persia has to look after a rebellous country and has given up any hopes of getting any part of Iraq while they face Russia in the north. India has all those tribes in Northern Pakistan to quell and has had any capital ship plans curtailed. From Germany's POV, it seems like a rather good agreement from both sides: the UK gets rid of an undefendable, unprofitable colony and gains goodwill from the two SATSUMA members closest to Suez (which might be VERY useful in the future), while India and Persia gain territory (of limited actual but large political value) and lose nothing but the ability to compete at naval building projects that they couldn't win anyway. Heh, of course whatever the 500 pound gorilla does attracts interest! Ditching Pakistan merely makes Malaya more vulnerable now if SATSUMA decides it no longer likes the agreement. In the eyes of Turkey, Britain has just cast its problem off onto the Russians, French and Turks if the agreement does hold indefinately. Pretty much he stated the point of view of India. We could not outbuild the all mighty British Empire so we gave up the right to build ships that take a lot of resources to concentrate in other endeveours. Also the political value of getting Pakistan outweights the real value of the region. The news of the Agreement are being played as a great victory, especially after the shock of SEAR Treaty. How it would sound if one of the signatory members of SEAR gave up a colony for basically nothing except for the promise of peace? We will honor the arrangements, at least for five years. Like I said, they probably forgot about giving a clear definition of a coastal submarine. Of course building a 2,000 ton submarine and label it as 'coastal submarine' would be a bit suspicious. Just like the Bismarck being 35,000 tons. Nooooo!! My fleet! You fiends! Well, that would be a signal to indicate that it is time to improve the connection. -My understanding of the border appears in the image below at the bottom of this post. In true imperial tradition, it is rather arbitrary, ignoring long-standing internal borders in favor of easy geographic references. This is why ~20% of Balochistan wound up in Bharat and ~20% of Sindh stayed with the new Baluchi state. -I'm assuming Karachi is an exclave, rather than having any kind of territorial corridor to the rest of Bharati Sindh. I'm going to estimate hand-over populations are around 80% of the above. Note that Islamabad wasn't built till the 1960s, so it doesn't exist here. -Based on the borders, I'd reckon WW Baluchistan has a population of around 1.8 M (~1 M * 0.8 from Balochistan, ~0.2 * 0.8 * 6 M from Sindh), while Bharat added everybody else. -Karachi/Sindh: As the state of Sindh (4 M), with the capital at Karachi (and some administrative functions at Hyderabad). Karachi might get split off as a separate state later on. -Punjab: As the state of West Punjab (16 M), with the capital at Lahore. There's already a Punjab state in Bharat, hence the geographic qualifier. Maybe a unification movement will evolve in time. -FATA, Khyber Paktunkhwa, Gilgit Balitstan, and the segment of Balochistan: As the state of Pakhtunkhwa (2.0 M), with the capital at Peshawar. -Azad-Kashmir: Incorporated into Jammu and Kashmir (+0.8 M), retaining the capital at Srinigar. I concur with that map. When I chose the boundary the Indus seemed the most natural border. Karachi is an enclave, I was thinking along the lines of an Indian-appointed city administration as an autonomous zone. How far that zone extends around the city should probably be defined if you think its a potential future problem. I don't see a need to draw out city limits. I don't quite agree with your understanding of Karachi governance, though. "Controlled" should mean "Owned, sovereign territory". Otherwise, we've got some weird neither-fully-Baluchi-nor-fully-Bharati stuff going on both there and in the Baluchi-controlled border towns, which is just asking for headaches. I agree, I was just illustrating that the Indian administration runs that city as part of Bharat. I can't remember why Karachi was singled out that way, perhaps Perdy at the time wanted to keep it? Anyhow that's how it is. 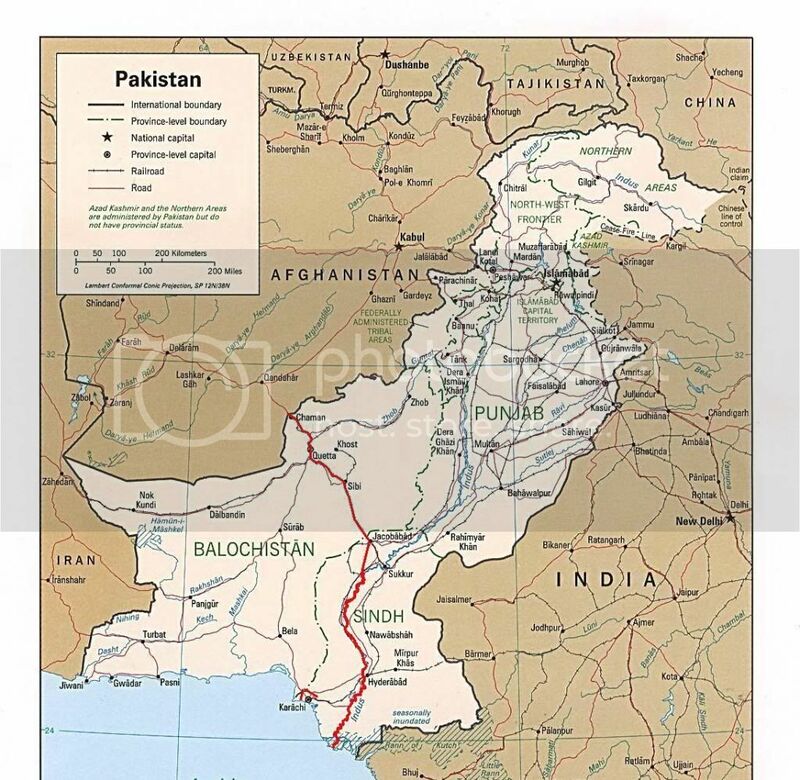 I think at one point, when Baluchistan was liberated from the puppet Persian regime Quetta was the capital. Probably not a good idea since its a border town. Perhaps Gwadar post-independence would make a better capital given its sea-links? Or they could do a Brasillia/ Islamabad and build a new capital somewhere (but that would take oodles of cash they probably could never raise). Gwadar would certainly be a reasonable choice for capital - they'll want it for a port anyway and as you note, their supply of cash will be tight.